﻿﻿﻿Poker tracker software allows you to track, analyse and improve your game by providing useful statistics on you and your opponents. 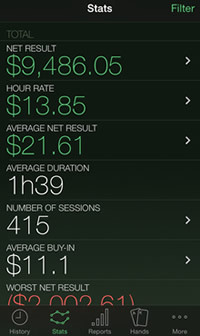 Poker tracker apps are now available for Android, iPhone and even wearable devices like the Apple Watch. You can monitor your progress by looking at your overall earnings, often with options to filter your results so that you can see what games you are most profitable in. You can review and replay previously played hands that you have imported, allowing you to analyse both your own strategy and those of your opponents in order to develop your ability. Some apps also offer a live HUD (heads-up display) that shows various player-specific statistics, an invaluable feature that can be used to exploit the leaks of your opponents as well as to make adjustments to your own. 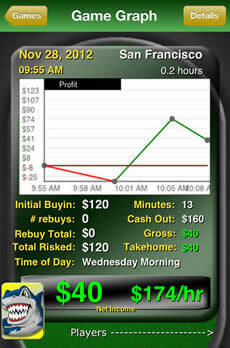 With all of these great tools in mind, you can see exactly why using a poker tracker app can benefit you. As the mobile online poker market continues to grow, more and more poker trackers are becoming available to iPhone users; our team have sifted through them all to find the best ones out there right now! 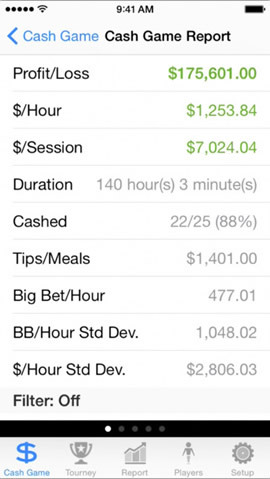 Offering one of the most complete poker tracker packages available for iPhones at the moment, Poker Income Pro is a phenomenal app. As recommended by numerous poker professionals, the software boasts of many great features including filterable graphs, a live HUD and player notes. A great aspect of this particular poker tracker is that you can import an unlimited amount of hands as it is supported by iCloud; you can backup and restore data at PokerIncome.com and even access your old hands from another smartphone or your computer. The included HUD features player statistics such as VPIP (voluntarily put money in the pot), C-bet %, check-raise % and aggression factor, meaning that you can make specific reads on your opponents and exploit their weaknesses. The provided filters allow you to look for fish by finding which players you have won the most money from. This feature can be a very profitable one as you can sit down next to players that you regularly win money against, use the inbuilt HUD to capitalise on their mistakes and extract maximum value from weak opponents! ​Given that this comprehensive poker tracker app costs only $9.99, you’ll be guaranteed to see a return on your investment very quickly with all of these valuable features at your fingertips. With a free trial available for iPhone users, you’d be crazy not to give it a try. 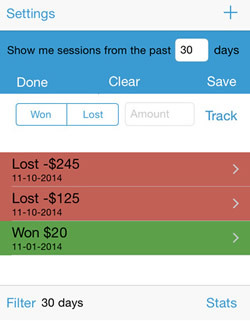 A no-frills app for tracking your poker progress, Live Poker Manager is the best at what it does. With a simple yet attractive layout, the software allows you to either import hands that you have played online, or instead record hands and session details from live games. As well as a clear graph which displays your overall earnings, you can find out your hourly rate, your overall play time and your return on investment for tournaments. 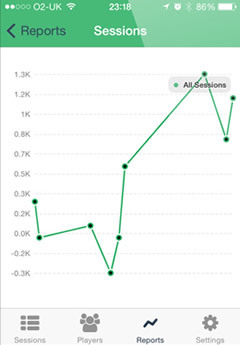 On top of all this, you can filter your sessions to see what games you are crushing and look for trends to find out what are the factors contributing to your biggest wins. ​The app also allows you to write notes for your sessions which is very handy – especially when playing live – if you have noticed any tells or tendencies from your opponents and are wanting to take advantage of their flaws. Though it is not the most complex tracker app on the market, Live Poker Manager is great if you are wanting either a simple way to monitor your progress or a helpful aid at your next live game. The aptly named Poker Track Pro has enough features to satisfy even the most experienced of poker players. The app breaks down your overall results in great detail, with a wide range of graphs and charts that show how profitable you are at which games, with which players, even at which time! An odds calculator is also included so that you can strengthen the mathematical foundation of your game and make sure that you are making the correct plays. ​Not only is there also a purpose-built player tracker so you can find the fishiest players on the felt, but there is even a casino locator within the app so you can quickly find where the closest live poker game is to you! To top it all off – and undoubtedly one of the greatest aspects of any iPhone poker tracker available at the moment – Poker Track Pro provides real-time AI commentary that informs you about player statistics at your table, alongside quoting priceless tips said by real poker professionals in order to help you out. As the informed commentator will definitely agree, getting this app will work wonders for your poker game. As its title suggests, Poker Analytics Pro is all about statistical analysis and is therefore most suitable for advanced players or those looking to work on the statistical fundamentals of their game. Hand histories are easily accessible and can be replayed so that you can review hands that you have previously played, working on your strategy and taking notes of the plays made by your opponents. This data can be backed up via iCloud which means that you can also access your files through other iOS-supported devices. With over 20 different player statistics available, you can create in-depth custom reports which feature charts and graphs that will help you to evaluate your own play and that of your opponents, putting yourself one step ahead of the competition. Don’t be put off by the comparatively high price of Poker Analytics Pro – it is an extremely detailed app, and you definitely get what you pay for! A free version with limited functionality is also available. ​Considering that it is entirely free to use, PokerTrack is a must-have app for all players who are looking for an easy way to follow their progress at the table. With unlimited hand tracking made possible through online storage (your data is accessible from any device that has the app installed), you can look at a graph which shows your earnings over every poker hand you have ever played. You also have the option to filter these results so you can see when you have been most successful and at what games and stakes. ​Notes can be saved on players and specific games which allows you to record key observations that you have made which can later be used to dominate your opponents. A unique and impressive feature of the app that will undoubtedly impress Apple lovers, PokerTrack is fully compatible with the Apple Watch which makes monitoring your progress just a wrist’s-turn away. Being the only completely free app on this list whilst still offering an array of features, there is no reason not to download PokerTrack today!